While we had previously discovered that Yext* and a number of local search agencies were going to be providing data to Apple Maps, it looks like Apple made it official some time this past month by adding Yext as a supplier of “Business Listings Data” to Apple Maps’ Acknowledgements page. 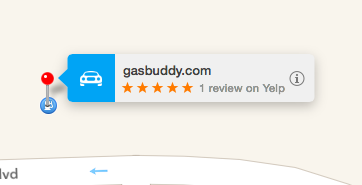 GasBuddy/OpenStore (GasBuddy.com): I assume this is to get gas prices attached to gas station profiles, but I don’t see this data on Apple Maps yet. GreatSchools (GreatSchools.com): I assume this is to add school reviews and other school data to the maps, but I haven’t seen this data on Apple Maps yet. National Land Survey of Finland Topographic Database: Might help finding your way around Helsinki. This should be a big deal for these companies as they can now officially tout to customers that they have direct feeds into Apple Maps. Most of the companies I outed in November were unable to even mention to most of their employees that they were working with Apple because of Apple’s NDA. My understanding as of the end of 2014 is that most of those companies were beta testing working with Apple and had little control or understanding of how Apple was using their data, including whether or not Apple was using their data at all. This public acknowledgement of Yext, GasBuddy & GreatSchools implies that they are or soon will be using data from these three companies. My bet is this is beginning of a trend where Apple Maps integrates consumer-focused third-party data into its business listings similar to how it has integrated Yelp. I wouldn’t be surprised if by the launch of iOS 9 this fall, that we start to see a lot more of these types of partnerships, particularly in areas like Hotel and Restaurant Reservations. I still expect Apple Maps to develop an integrated app strategy where the map will know that you have a certain app on your phone that has data relevant to your map query and will either display the data on the map or provide the ability to open the app to complete the query, similar to what Google Maps is doing with Uber. This may end up being a great app discovery tool as well if AM starts suggesting apps based on your map queries. They already do to some extent with relevant apps at the bottom of the POI profiles, but I imagine this is pretty invisible to most users.